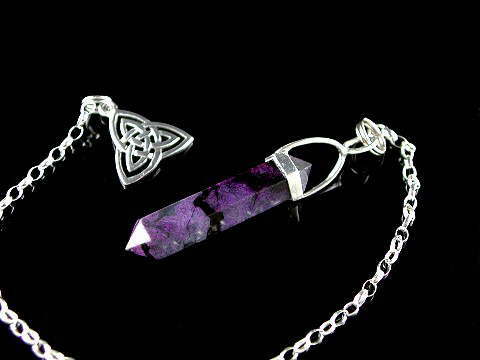 Exquisite, rare Sugilite point pendulum, set in a 925 sterling silver collar mount with 925 sterling silver Celtic Triquetra 'topper and belcher chain. Sugilite (also known as Luvulite or Royal Lavulite) is most definitely a stone for the New Age. It is an incredibly powerful healing stone which represents spiritual love and wisdom. When used or worn Sugilite is said to help us assimulate the new energies that have started filtering through to the planet post-2012. Sugilite helps this energy flow, firstly, into the upper 12th through 8th chakras, then on into the 7th, Crown chakra, before finally filtering down through the 6th (Brow) to 1st (Base or Root) chakra. As it flows, this energy cleanses, recharges and then starts to align our subtle energy bodies with the the new vibrations. These vibrations resonate at a much higher frequency than we have previously experienced and with this energy change comes new chakra colours, too. They are becoming more iridescent, with an almost metallic quality; rather like the appearence of oil on water. These changes are increasing our light body quotient, helping strengthen our connection with the ‘Source’, resulting in an almost open channel. This is the first step on our spiritual evolution from becoming 3rd to 4th dimensional beings. Sugilite is also perfect for undertaking any Violet Flame work. This beautiful crystal resonates with the energy of St Germain, Ascended Master of the 7th Ray, or Violet Flame and with Zadkiel, Archangel of this realm. Just as sunlight passing through a prism splits into seven colours, so spiritual light manifests into seven rays. The energy of the 7th Ray bursts forth and burns like a violet flame, disipating fear and darkness, inspiring the qualities of mercy, compassion, forgiveness, justice and freedom. It is said that the Violet Flame is the key to resolving and removing all karmic debt, not only for ourselves and others, but also for the planet. The Triquetra is an ancient and magical symbol that's been in use for thousands of years. To Christians it represents the Holy Trinity; Father, Son and Holy Ghost, but as with much in Christianity (like the Pagan goddess Eostre becoming the Christian 'Easter'), this symbol was adopted from a much older belief system. Before the Christians, it was in use by the Celts and Pagans who believed it represented Life, Death and the Afterlife or the three stages of life; Maiden, Mother and Crone. However, it can trace its origins still further back to the Ancient Greece. The tripartate form we know as the Triquetra started life as an ancient and mystical Pythagorean symbol. This symbol is at the very heart of Sacred Geometry; being the starting point for the Flower of Life and in turn, Metatron's Cube. It is a very important, magical and powerful symbol.